There are times of the year I associate with bad cheese. 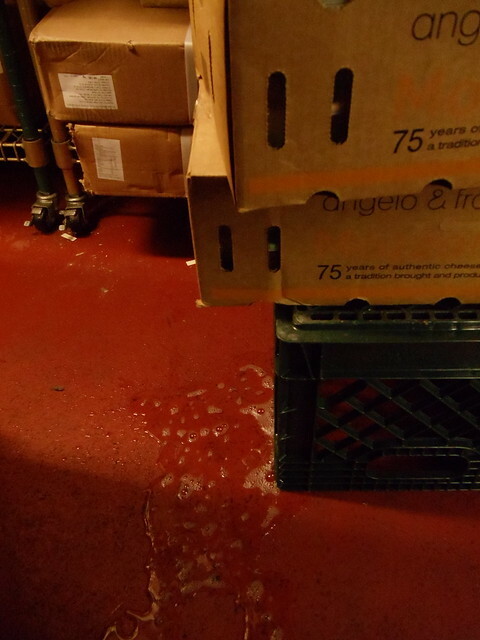 Usually it is after a holiday, when a distributor has bought too much of something perishable that didn’t sell. Buyers are alerted to these deals with flyers titled things like “Hot Sheet”, “Killer Deals”, and “Margin Builders.” This is definitely risky buying for the most part. You can make good money and still put things out cheap, but when these go bad, they go bad in a hurry. The week after Thanksgiving can be one of those weeks. So, I was quite surprised when I had a week of bad cheese, and none of it from those kinds of sales. I don’t want to go into detail here (sorry), partially because I am still negotiating credit on some of this stuff. 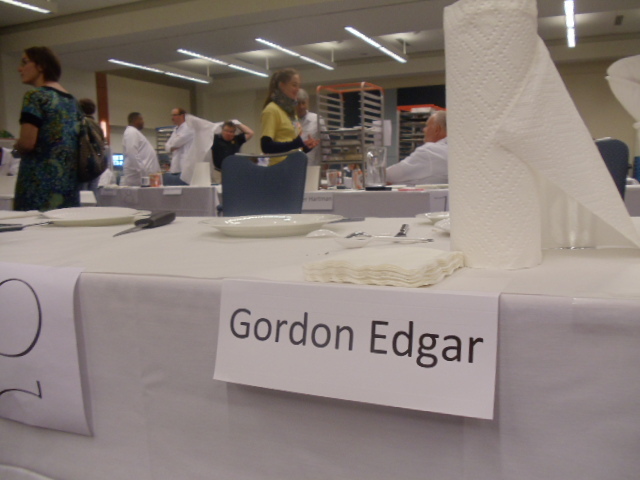 But instead of a ““Gordon’s purely arbitrary cheese obsession of the week” entry, I was inundated with cheese that made my tongue hurt. 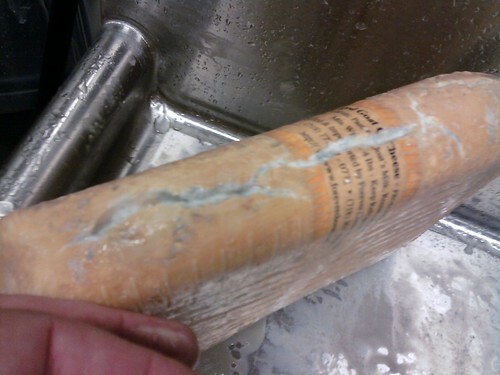 The first thing that was killer was about 200lbs of cheese that a distributor ordered and then – because of their own corporate machinations – sat on for two months without attempting to sell. The cheesemaker asked me, as a favor, if I would take it all and sell anything I could at whatever price I could. I was excited because I love this person’s cheese, and I figured anything salvageable could be amazing. Sadly, not of it was. 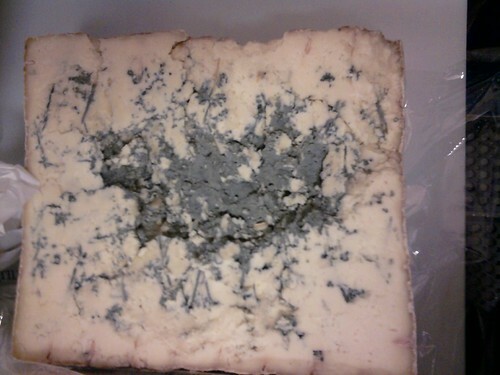 When I think of awful blue cheeses I think of bad Spanish Cabrales. Not good Cabrales, mind you. I love that. 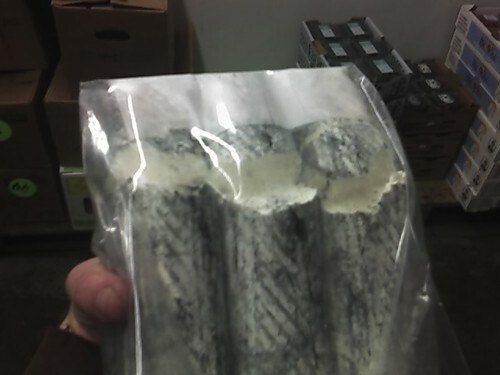 But when Cabrales gets too old it turns dark, even nearly black at times. The paste gets as hard and shardy as shale and it is too intense to even swallow. And of course I’ve tasted this. The difference between a cheese professional and a well informed cheese enthusiast is this: I have tasted almost every cheese at its best and at its worst. This salvage blue: probably the worst blue I’ve ever tasted. Partly that’s because it started out strong but nice. When I first put it in my mouth I was thinking about calling the maker, encouraging them to age their cheese longer, even special ordering extra aged wheels and selling them as something like, I don’t know, Gordonzola Extra-Aged, Select Reserve Aged for Extra Time. The cheese trap was sprung. A moment after this fleeting thought, the cheese turned on me. What was strong became bitter. What was fruity became excess fermentation. 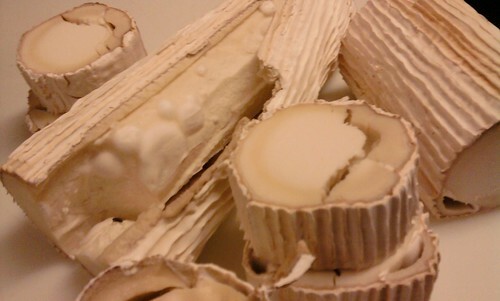 What was butterfat became rancid. This was up their with bad Cabrales in intensity. This was a cheese I couldn’t spit out fast enough. Unfortunately, that wasn’t the only bad cheese of the day. Another cheese, one of my favorites actually, came in like it was trying to trick us. Out of 24 wheels, only 3 were sellable. The three that were sellable were awesome and, unfortunately the one we tasted upon arrival was one of the few good ones so it wasn’t until we sold a few that we realized that there was something very, very wrong. Unlike the good examples, which were complex, rich, earthy, and awesome, the bad ones were diaper-smelly, bitter, cloying and intense. 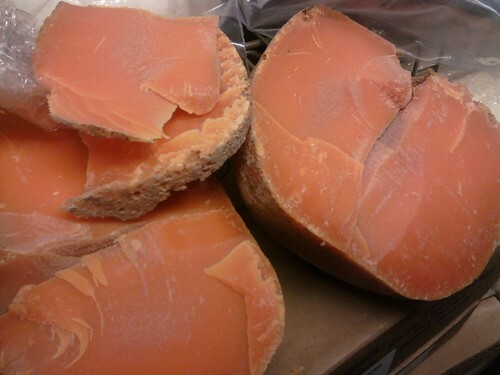 This cheese – a department favorite – cast a pall over the rest of the day. We almost cried at the disappointment of its badness. This is a cheese that we all love to recommend when we have it. Its great potential turned to evil was a metaphor we didn’t want – or have time — to contemplate on the retail floor. I’m a cheesemonger. That means I am a retail worker with a pretentious title. I have to deal with the things that all retail workers need to deal with, the most annoying being the occasional customer with entitlement issues. Things are actually better now. During the dot com boom, some customers would literally time discussions and then tell you how much money you cost them by answering their questions and addressing their concerns. San Francisco retail is much better than Marin retail because you actually mostly have reasonable people who have occasionally in their lives heard the word “no”. The thing that causes the most problems is our return policy. We have tried to have a reasonable return policy for reasonable adults. To be totally honest with you, Dear Reader, I argued 15 years ago that we just needed to give up, that we should just take all returns because you never win arguments with customers, indeed, you never want to have arguments with customers. It stresses the workers and makes customers not want to return. I get the concept, I really do. Even it really is a triumph of capital over society. The wrong answer. This unleashed a stream of Whole Foods this and Trader Joes that. Anywhere else he could just give people his word and they would give him product in exchange, no questions asked, no matter what it now cost. During this onslaught, I started to think about timing. The thing is, while our store is not always the best about customer service, it comes from a place of treating people as equals all the way down the line. Ethically, I am not going to go to a distributor and say, “I need full price credit for this perishable product that I bought on sale which a customer says went bad sometime in the two months since he purchased it. No I can’t really say for certain it was kept refrigerated.” I may authorize the return, but I’m not going to ask someone else to pay for it. I don’t work for a national chain bully. But beyond that, why is this acceptable anywhere? God help us when the pinko commie worker-owned co-op is the only place left arguing for personal responsibility. Seriously, it’s a societal problem when this is condoned as normal behavior. If I was in this situation I would think, “I bought too much of that perishable product. That was dumb,” and throw it away. It goes without saying that most people aren’t like this type of customer. I will state here, for the record, that I actually like and feel kinship with most of the customers I talk to on a daily basis. People with this attitude of entitlement, however, are a real problem, yet they take up so much time and energy, and cause such annoyance, that it’s easier to give in and just give them credit rather than treat them as human beings with functional brains who made specific – and in these cases, poor — choices. What does it cost us, as a community, when many retailers treat community members, as if they are spoiled children. The customer is not always right, sometimes demonstrably so. Saying this is retail suicide, but continuing to pretend that they are – privileging the consumer over other parts of the food system – may, on some small but insistent level, be societal suicide. So, if you follow my facebook, you may know that the schnauzer snacked on my phone the other day. It is still (barely) operational, so I went through all the photos, trying to save the good ones. While going through these, I came across the damaged cheese photos that I used to get credit from distributors. Work-wise, that is the best thing about cell phones. 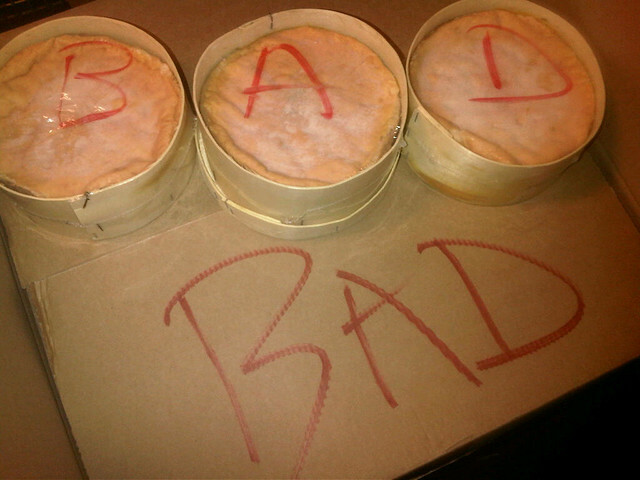 Text over a picture of bad cheese on arrival and there is no room for argument. Let’s start off ordinary. Here are some badly shipped fresh ashed goat logs. They probably looked great in the warehouse. Maybe someone should have thought about it before packing them loose in a box with Manchegos. This was impressive. You can’t really tell from the photo, but that entire green mass was dust that fell out upon making the first cut. For mold lovers only! 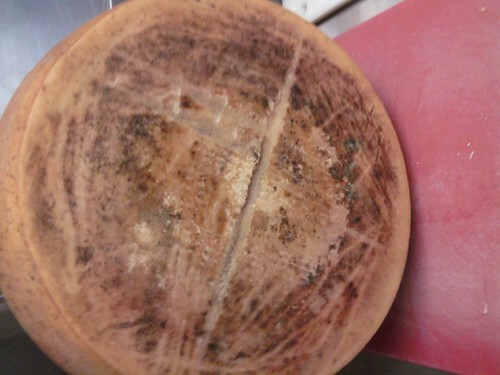 This French Tomme was supposed to be a whole wheel. I guess someone quartered it for samples then forgot about it. We had ordered 30 wheels of this stuff for a promotion and all the other wheels were full and in great shape. Just this one, sad, plastic-wrapped and quarted wheel was mixed in the stack. No, we can’t use it for samples. 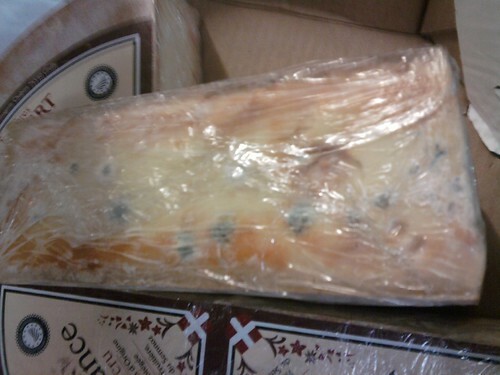 Someone shipped this with heavy cheese on top and this poor little Spanish cheese on the bottom. It went squishy. You could tell if had happened a long time ago (most likely from Europe to the US) due to how much and how deep the mold was. Coat-slipping, falling apart, and with mold in all the wrong places, I still think this is pretty, even if unsellable.